I keep a close and interested eye on the world of ebooks, and I’m pleased to report that it keeps getting weirder. British supermarket chain Sainsbury – who I worked for once, helping to program a new payroll system for a few months, until they scrapped the whole project – recently bought HMV’s share in ebook hub Anobii for a whopping, er, one pound. (Americans: that’s about $1.50.) Huh? Meanwhile, HarperCollins announced its “HarperCollins 360” global publishing program, which at first I thought was them taking a page from the music industry’s post-Napster ‘360 deals‘ — but no; on sober second thought it has nothing to do with those except for name. Instead it’s an attempt to make all of their English-language books available to all English-language readers. I know, I know: they’re only doing this now? Just as ebook revenue exceeds that of hardcovers? Ah, publishing. Meanwhiler, Startup Weekend founder and semi-vagabond Andrew Hyde Kickstartered, wrote, and self-published a travel book called “This Book Is About Travel,” and then discovered that Amazon was marking up its digital delivery fees to the tune of an estimated 129,000%. Nice margin if you can get it. That’s after I made a few of my books free for a couple of days under Amazon’s Kindle Select program. Which requires you to publish your books exclusively on Kindle, incidentally. I was content to do, since my iBooks sales were more or less nonexistent — but it’s really unclear how this works with my having previously released all these books under a Creative Commons license. I suspect the notion of authors giving away their books in perpetuity seems so weird to Amazon that it never really occurred to them. What Amazon thinks matters. They remain the big dog of the book industry. The Kindle has dwindled from a vast majority to a small minority of Hyde’s sales — as he puts it, “Kindle Sales Vanish When Users Know About Their Fees To Authors” — but that’s a special case. With ebooks, at least in the USA, Amazon’s Kindle is dominant and everything else is irrelevant. Which ain’t necessarily so bad; some self-published authors are making a pretty good living off the Kindle ecosystem. Not me, obviously, but I still find the above chart cheering: close to twenty thousand downloads of my novels Invisible Armies and Night of Knives in two days, with zero publicity. But of course virtually no one went on to actually buy the books. At least I have a lucrative software job; but just so you know, a lot of people who write really good books are in such dire financial shape that they may never be able to afford to take the time to write another..
What irritates me most, though, is that I’d like to make these books available for free forever…but of course Amazon won’t allow it. And again, they’re the big dog. Twenty thousand downloads in two days; that’s more than all my books combined get in a full month on Feedbooks. 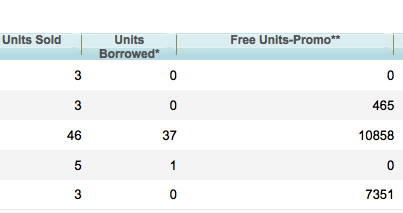 And I only just cracked Amazon’s Top 40 Free Books bestseller list. I’m convinced that in the long run we’ll move to business models where paying for a book (or song, or video) is accepted as a) strictly voluntary b) often something you do after reading/hearing/viewing it. For the record, I view this as more inevitable than desirable, but I also think that this will ultimately be good for artists–as long as we can get the reading/listening/watching masses to accept this cultural shift, and to voluntarily choose to pay for the things they enjoy, sometimes after they’ve enjoyed them. That will not be easy. And it’s not being made any easier by the existing entrenched business models fighting voluntary payment tooth and nail. By doing so they’re inadvertently teaching a vast audience of consumers that paying for books, music, and TV is something you only do if/when you have no choice in the matter. Call me a crazed idealist, but I think that instead we need to convince consumers that they need to pay money because that’s what supports the storytelling they want; and I fear the entertainment industries of the world will eventually find that what feels like hanging on tooth and nail actually means slowly gnawing their own limbs off.